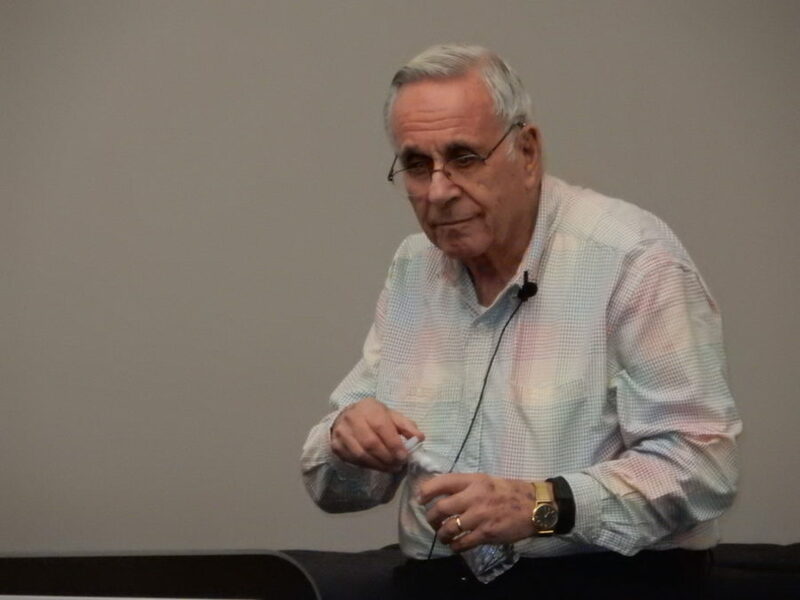 Steen Metz, who is an 83-year-old survivor of the Holocaust from Denmark, spoke to an audience of roughly 200 interested audience members on Tuesday, November 13th, 2018 at the Moline Public Library. Steen grew up in Odense, Denmark, a small town 100 miles west of Copenhagen, where only .2% of the population was Jewish. Neither Steen’s father, an attorney, nor his mother were practicing Jews, although Steen’s father was raised in a practicing Jewish family. On October 2, 1943, when Steen was 8 years old, his family was herded into a cattle car and spent 3 days traveling to Terezin Concentration camp in Czechoslovakia. They had no food, no water, no bathroom facilities and the adults had to take turns standing or sitting during the 3-day journey. He recalled that one elderly adult in another car committed suicide on the journey. The camp was called Theresienstadt in German; it was not an extermination camp with gas chambers. 150,000 people were held there and only 17, 247 survived. Steen and his mother somehow managed to be placed together in the barracks. His “job” as an 8-year-old was to be a messenger boy. When asked if he ever read any of the missives he explained that he did not speak or read German. He did, however, occasionally steal a potato when he had the chance, as he and his mother and all the prisoners were starving. Hitler had invaded Denmark by land, sea and air on April 9, 1940. For three years Danes were allowed to go about their lives in roughly the same way they always had. His father continued to practice law. He continued to attend public school. Part of the reason for this was that, in a country of 4 and 1/2 million people, only 8,000 were Jewish, and most had already fled to Sweden, which was neutral and opened its borders. Another difference for Steen was that he was not tattooed, as we assume all Holocaust survivors were. Also, in the later stages of the incarceration, the inmates were allowed to receive packages, but sometimes the guards would open them, remove the goods or food, and replace the contents with rocks. Steen’s father was made to dig ditches and ultimately died of pneumonia. His mother survived and remarried in 1951. She lived to be 91. The camp where Steen and his mother were held was made to appear to be a “model” camp and filmed for use in propaganda films. A gazebo was constructed, the facades of shops were freshly painted (there was no running water anywhere) and healthy French children were brought in to play in the streets. On June 23, 1944, a group from “outside” came to Terezin to tour, proving to the rest of the world that the camps were not systematically starving people, as they were. There were 470 Danes in Terrazen, of whom 420 were liberated. 50 died of starvation. 4 babies were born there and 2 of them survived. All but 4 of Steen’s family survived and, when he and his mother returned to their small village, his father’s firm had put their belongings in storage and most belongings were returned to the pair. Steen joined a Danish food company after he grew to adulthood and was sent to Canada. He met his wife there (a British citizen) and they came to the United States in 1962. He retired in 1999. He estimates he has spoken to 65,000 people about the Holocaust and each of us was to tell 4 other people that the Holocaust was real. He warned about the current climate of hate and anti-Semitism abroad both here and in Europe, pointing to the Pittsburgh of 11 Jewish worshipper at a synagogue there. When asked if his experiences had made him a more intense follower of the Jewish faith, he answered, “No” and explained that he had not been brought up in a religious home and that claiming that distinction in post-war Europe was not really that good an idea.